Le Bernardin is one of my favorite restaurants anywhere in the world. Unlike so many of his peers, Ripert has decided to focus almost exclusively on a single restaurant rather than build a global empire. 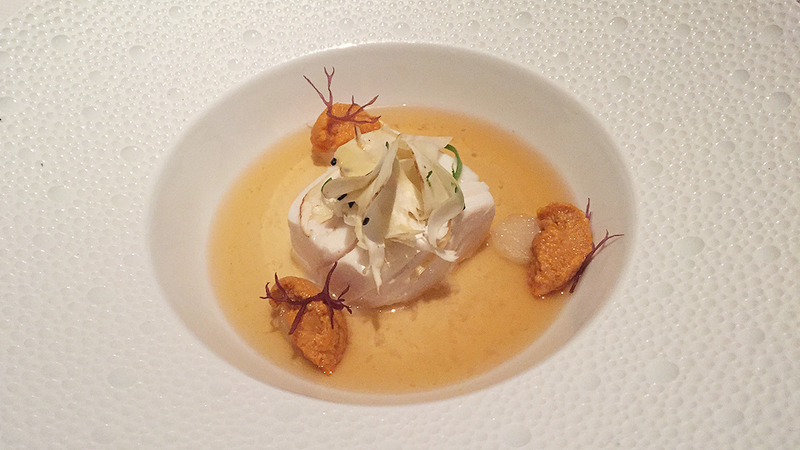 On most days, Ripert is at Le Bernardin, as he was again on this day. Ripert’s single-minded passion and total attention to detail are two of the many things that make Le Bernardin so special. This lunch was a superb treat and a nice break in the middle of a very busy week. 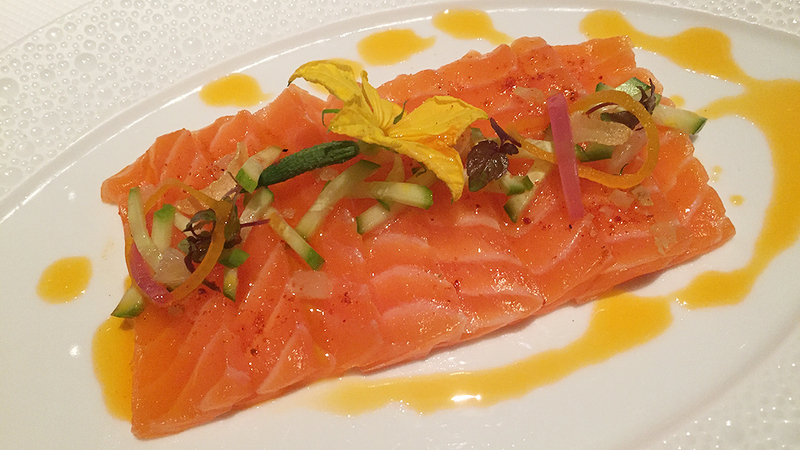 My salmon sashimi appetizer, arranged in thin slices and dressed with Amahari-Argan oil, is absolutely delicious. The poached halibut is a classic Eric Ripert creation that speaks to finesse and, above all else, intensity without weight. Thinly sliced Matsutake mushrooms and sweet sea urchin add layers of nuance to the perfectly cooked fish, with accents from the dashi broth that perk up the flavors. 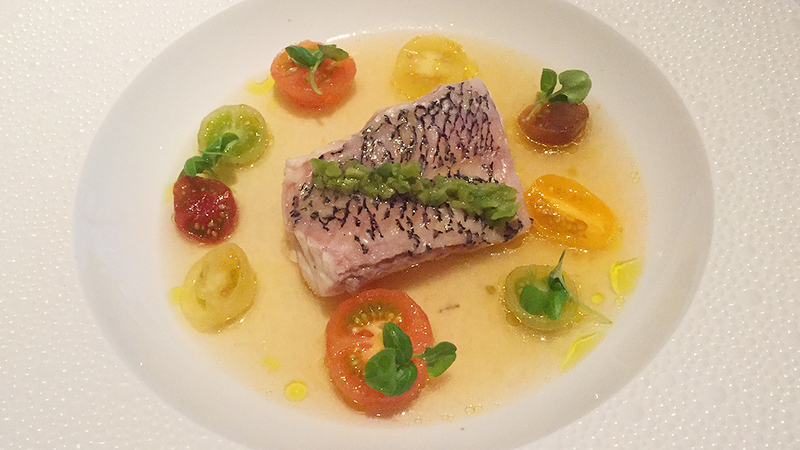 The steamed black bass is a similarly conceived dish with slightly bolder tones from the marinated tomatoes and the basil-verbena-tomato consommé. The NV Blanc de Blancs from Diebolt-Vallois is tasty and refreshing, if not especially exciting. Maybe I am a bit jaded, but I think a restaurant of Le Bernardin’s caliber should serve a Champagne that is more inventive and philosophically aligned with the cuisine. Goisot’s 2014 Bourgogne Côtes d’Auxerre Gueules de Loup emerges from a hillside parcel on chalky, limestone soils near St. Bris, where the winery is located. Bright and energetic, the Gueules de Loup is a tasty white that has enough character to stand up to the food without being overpowering. I don’t have a huge sweet tooth, but it is hard to pass up Le Bernardin’s desserts. 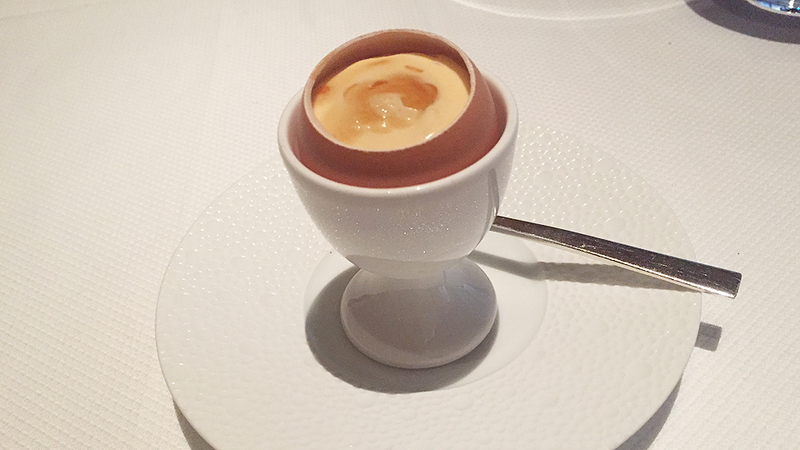 The milk chocolate pot de crème, served in an eggshell, offers quite a bit of contrast from the sweetness of the custard and caramel, with the brininess and slight crunch of the sea salt. 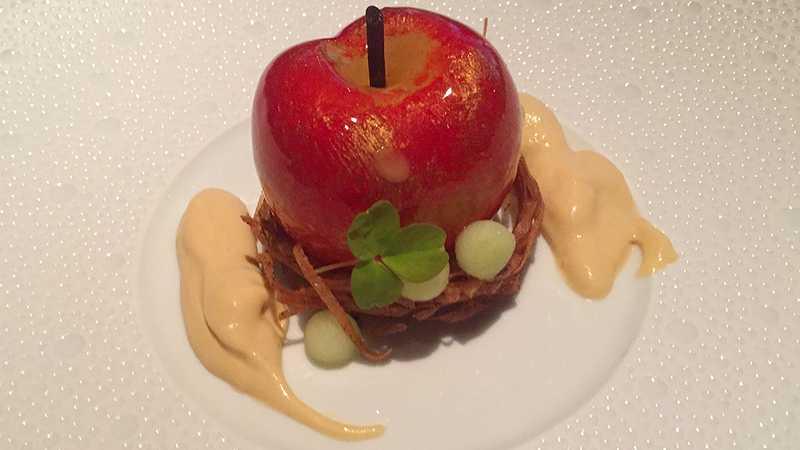 The faux apple, which consists of an apple brown butter mousse in a light cake with a sugar topping made to resemble a real apple, is outrageously delicious. The only disappointment in this lunch is the bitter, undrinkable Nespresso that is served after dessert. Let me be clear, I don’t have anything against Nespresso or other similar coffees. They are fine for hotels, offices, homes and other places where convenience is of the essence. But not in world-class restaurants that are supposed to offer the best of the best. Fortunately, the chocolate canéle gets rid of most of the astringency of the coffee and end this superb lunch on a high note.